Sorry I haven't posted in a while. Life around here is picking up with the baby coming in only a month -- yikes! I'm trying to squeeze in some last precious moments with Libby and JD before No. 3 comes along to monopolize my time. Not to mention all the STUFF that needs to get done before the delivery. The list is endless! However, I'm still cooking; we gotta eat! So here's a recipe that appeared in Taste of Home a few months ago. I just loved it! It was such a great, new way to use pork loin. I actually made it using about 1 pound of leftover pork loin roast that I chopped into bite-size pieces. If you want to do that, just start the recipe at the second paragraph. 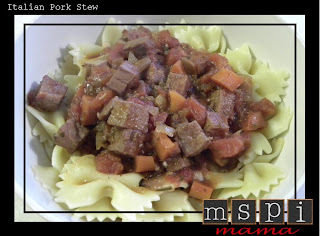 And since I was using already cooked and tender pork, I was able to cut back on the simmering time by half. Place flour in a large resealable plastic bag. Add pork, a few pieces at a time, and shake to coat. In a Dutch oven, brown pork in 3 tablespoons oil in batches. Remove and keep warm. In the same pan, saute onion in the remaining 1 tablespoon of oil until crisp-tender. Add garlic; cook 1 minute longer. Add the tomatoes, wine, bay leaves, cinnamon, tomato paste, vinegar, anchovy paste, herbs, salt, pepper flakes, pepper and pork; bring to a boil. Reduce heat; cover and simmer for 1-1/2 hours, stirring occasionally. Stir in parsley. Cover and cook 30-60 minutes longer or until meat is tender. Skim fat; discard bay leaves and cinnamon. Tip: I listed the cinnamon as optional because I completely forgot to include it in my stew, and the carrots are optional because they aren't included in the original recipe. I just decided to toss them in as a way to get some extra veggies in my kiddos. I have always detested eggplant. The texture. The taste. Yuck. But then I took a trip to Romania with my family for a wedding in 2001. While there, I was introduced to the most delicious eggplant spread. A whole new world was opened to me. I'm still not eggplant's biggest fan, but I don't shudder at the thought of eating it either. This recipe from Tyler Florence isn't identical to what we had in Romania, but it is delicious. My mom makes this like crazy in the summer with eggplant from her garden. It even freezes really well! Just put the spread in a freezer-safe container and freeze. Just thaw completely in the refrigerator when you're ready to eat it. Delicious! Split the eggplants in half through the stem and score sides. Drizzle with olive oil and season with salt. Grill eggplants on a very hot grill pan until skins are wrinkled and black and flesh side is nicely charred. When the eggplants are cool enough to handle, cut off tops. 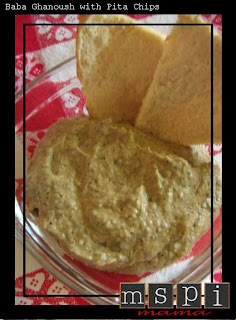 In a food processor, combine eggplant, garlic, tahini, lemon juice, cumin and cilantro and puree until smooth. Season with salt and pepper. Pour in the olive oil and pulse again to incorporate. Taste and adjust seasoning, as needed. Pour into a serving bowl and garnish with a drizzle of olive oil and some roughly chopped cilantro. Preheat oven to 375 degrees. Lay out pita wedges on a tray, coat chips with cooking spray or brush with oil. Sprinkle with salt. Bake in the hot oven for 10 to 15 minutes until warmed through. If you prefer a crispier pita bake for a further 5 to 7 minutes. Tip: Tahini paste is made from ground sesame seeds. Depending on the store, it can be found with the peanut butter, international foods or natural food section. One of the keys to surviving this diet is having friends and family that support you through it. They can be such an encouragement. Of course, if they have been through it themselves, then they are doubly wonderful. I'm fortunate enough to have so many friends right here in Omaha that have dealt with MSPI and can share their knowledge (and recipes!) with me. Many of them read this blog, and I want you ladies to know I love all of you very much! Now, one of these wonderful friends of mine is Laura, who gave me this recipe, which comes from the Food Allergy Mama blog. Food Allergy Mama has a new baking cookbook. The recipes are free of dairy, eggs and nuts. Some of the recipes do contain soy, so either avoid those or find an MSPI-friendly substitute. The great thing about her recipes is that she doesn't use any unusual substitutions (like special egg replacers, etc.) other than making sure the "regular" ingredients are safe. And for anyone who avoids eggs, you know how hard it is to bake without eggs, but Food Allergy Mama's recipes are fantastic! 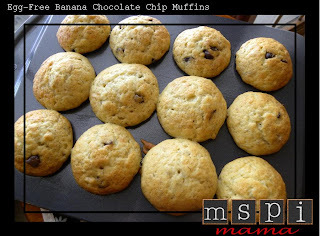 These muffins are great for breakfast, snacks and as a healthy dessert. Preheat oven to 375ºF, and coat a 12-cup regular-size muffin pan or a 24-cup mini muffin pan with baking spray. In the bowl of a stand mixer fitted with the paddle attachment, combine mashed banana, water, melted margarine and soured rice milk until well incorporated. In a medium bowl, combine flour, sugar, baking soda, and baking powder with a wire whisk. Add dry ingredients to banana mixture, and mix well. Stir in chocolate chips and divide batter evenly among prepared muffin cups. Bake 15-20 minutes for regular muffins or 12-15 for mini muffins, or until golden brown and cake tester comes out clean. * To make the soured rice milk, mix together 1/4 cup rice milk with 1/4 tbsp. lemon juice or vinegar and let stand 5-10 minutes. Tip: If you want to use a frozen banana and didn't take the time to thaw it, place the frozen banana in the sink under a stream of hot water for a few minutes. Peel the banana, removing any strings, etc. If the peeled banana is still frozen, zap it in the microwave, about 1 minute, until it's soft and can be mashed easily. Anyway, so I'm going to go ahead and post this uber-simple recipe. 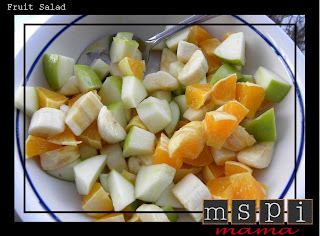 All you do is chop up your favorite fruits (My faves are apples, oranges and bananas but just about any fruit will work.) and toss it with a little bit of honey and lemon juice. Voila! The perfect side when making something for brunch or breakfast-for-dinner. In a bowl, toss together the fruit. Drizzle with honey and lemon juice. Toss again.